A name-letter effect in the Dutch elections? No. Presumably, I was doubting because Femke Halsema stepped down as GroenLinks' leading lady. Halsema was a very cable woman, but more than anything else she was attractive. She has been replaced by Jolande Sap, who might be equally capable, but is not nearly as attractive. Of course, I'm not the only person who is influenced by such superficial things as facial attractiveness or perceived competence. Quite a few studies have shown that the outcome of an election can be predicted reasonably well by people's initial reaction to pictures of the candidates' faces. And when I say 'initial' I mean within a few hundred milliseconds. The nice thing about elections (if you're a geek) is that it gives you a lot of data to play with. In case you're interested, you can obtain the results of the Dutch elections in spreadsheet format from here. Using this data, I figured it would be interesting to see if voting patterns are influenced by another subliminal phenomenon: The name-letter effect. The name-letter effect refers to the phenomenon that people like their own initials so much that they tend to choose professions and live in places to match. Inadvertently, of course. For example, my name is Sebastiaan Mathôt, and my egocentric love for S's and M's could be what drove me to work as Scientist in Marseille. Voting is anonymous, so you cannot investigate the name-letter effect proper (you'd need names), but you can do something similar: You can see whether the first letter of a region's name predicts the regional voting pattern. More specifically, I looked at whether the first letter of a region occurred in the abbreviation of a party (in Holland, most parties are referred to by their abbreviations). So, for example, Amsterdam and the PvdA (the moderate left-wing party) are matches, and so are Venlo and the PVV (the right-wing extremist party, which is unfortunately the third largest party in our once-tolerant country). Rotterdam and SP are non-matches. Well, you get the idea. So I determined for each combination of region and party whether it was a match or not. I included only the six largest parties, because they have unambiguous abbreviations, and are thus easy to analyse (unlike, for example, GroenLinks and ChristenUnie, which don't have a commonly used abbreviations). So what do you get if you split voting percentages by match and non-match? The percentages above are across all parties and regions. So the 16.8% means that (from the six selected parties) a party gets on average 16.8% of the votes in a region that matches in the sense described above. The 14.2% means that a party gets on average 14.2% of the votes in a region that does not match. (Of course, some parties get more votes than others, as you can see in the figure below.) This effect is statistically highly reliable, as you can see from the error bars, which reflect the standard error. So the short answer is: Yes, there appears to be something akin to a name-letter effect in the results of the 2012 Dutch elections. The long answer is a bit more intricate, because you can do this analysis in many different ways, and you may not always get the same results. Also, there may be trivial biases. For example, in this case there is a match between the largest city (Amsterdam) and the largest left-wing party (PvdA). It's a given that left-wing parties do well in large cities. This doesn't have anything to do with names and letters, but with the demographics of large cities (ethnic diversity, etc.). As you can see above, the effect doesn't hold for all parties. In fact, it's mostly driven by the PvdA and PVV, for reasons unbeknownst to be. In the figure below the effect is split by region. Only those regions that have matches are included. 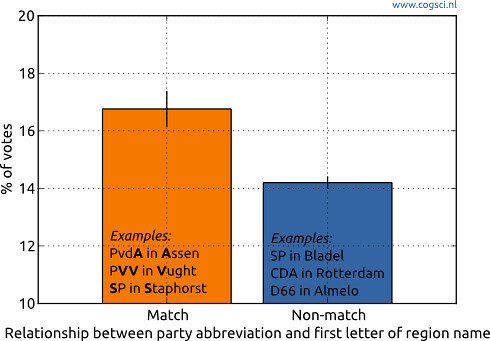 For example, Rotterdam is not included, because none of the six party-abbreviations contains an R. Beware though: The graph below is very difficult to interpret, because of the differences in voting percentages for the six parties. For example, regions that start with a V match all of the top three parties (VVD, PvdA, and PVV), but none of the bottom three (CDA, D66, and SP). No wonder, therefore, that matching parties score better than non-matching parties in Venlo, Valkenswaard, Veendam, etc. Conversely, Culemborg matches only the fifth largest party (CDA) and in this region there is therefore am unsurprising 'reverse name-letter effect'. So the name-letter effect in the results of the Dutch elections might be a statistical curiosity. Or it might be a real subliminal phenomenon. Do you want to believe?